We are pleased to bring the blues back to the Gopherwood stage with Shari Kane and Dave Steele along with local music man Frank Youngman. Together they will bring a sound that's been absent from our stage for quite some time. Don't miss this unique chance to see these performers on the same stage. 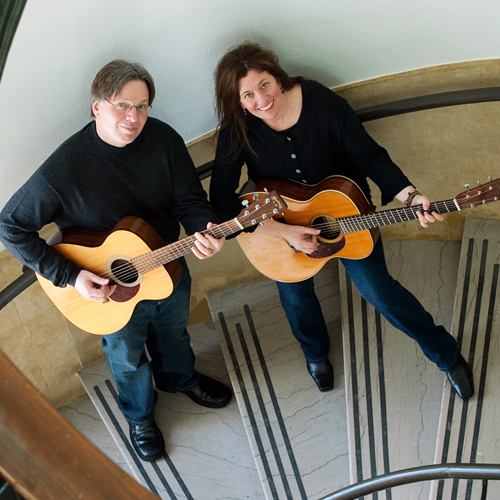 As an acoustic blues duo, Shari Kane and Dave Steele throw a four handed guitar party of original and time-honored blues, gospel, swing and ragtime. Steeped in Dave’s smoky vocals, percussive rhythm and innovative lead lines, Shari’s crisp picking style, rootsy leads, and stinging slidework, their music has been described as “street swing and stomp blues,” – like a testament to sounds once heard on the streets of Harlem, the juke joints of Mississippi, the Carolina hills or the jug bands of Memphis . They will be joined on stage by Cadillac's own Frank Youngman. He has graced the Gopherwood stage on numerous accations with Jive at Five along with volunteering for our annual fundrsaiser to name just a few. We are thrilled to present this double headliner show and know it will be a performance you will not want to miss. Advance tickets $15 for adults, $18 at door, $7 for students 13-18, $9 at door, and 12 and under free with adult. They will available at Toy Town and The After 26 Depot Cafe in downtown Cadillac, online at My North Tickets and via phone at 1-800-836-0717.